Confessions of an Advertising Man, the standard introduction to advertising, is being reissued by Southbank Publishing with a new foreword by Sir Alan Parker. 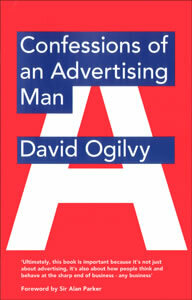 This seminal business classic distills all the successful Ogilvy concepts, tactics and techniques. Read a sample free of charge here on Think. The headline is the most important element in most advertisements. It is the telegram which decides the reader whether to read the copy. If you haven't done some selling in your headline, you have wasted 80 per cent of your client's money. The wickedest of all sins is to run an advertisement without a headline. Such headless wonders are still to be found; I don't envy the copywriter who submits one to me. A change of headline can make a difference of ten to one in sales. I never write fewer than sixteen headlines for a single advertisement, and I observe certain guides in writing them. (1) The headline is the "ticket on the meat". Use it to flag down the readers who are prospects for the kind of product you are advertising. If you are selling a remedy for bladder weakness, display the words BLADDER WEAKNESS in your headline; they catch the eye of everyone who suffers from this inconvenience. If you want mothers to read your advertisement, display MOTHERS in your headline. And so on. Conversely, do not say anything in your headline which is likely to exclude any readers who might be prospects for your product. Thus, if you are advertising a product which can be used equally well by men and women, don't slant your headline at women alone; it would frighten men away. (2) Every headline should appeal to the reader's self-interest...It should promise her a benefit, as in my headline for Helena Rubenstein's Hormone Cream: HOW WOMEN OVER 35 CAN LOOK YOUNGER. (3) Always try to inject news into your headlines, because the consumer is always on the lookout for new products, or new ways to use an old product, or new improvements in an old product. The two most powerful words you can use in a headline are FREE and NEW. You can seldom use FREE, but you can almost always use NEW - if you try hard enough. HOW TO, SUDDENLY, NOW, ANNOUNCING, INTRODUCING, IT'S HERE, JUST ARRIVED, IMPORTANT DEVELOPMENT, IMPROVEMENT, AMAZING, SENSATIONAL, REMARKABLE, REVOLUTIONARY, STARTLING, MIRACLE, MAGIC, OFFER, QUICK, EASY, WANTED, CHALLENGE, ADVICE TO, THE TRUTH ABOUT, COMPARE, BARGAIN, HURRY, LAST CHANCE. Don't turn your nose up at these cliches. They may be shopworn, but they work. That is why you see them turn up so often in the headlines of mail-order advertisers and others who can measure the results of their advertisements. Headlines can be strengthend by the inclusion of emotional words like DARLING, LOVE, FEAR, PROUD, FRIEND and BABY. ONe of the most provocative advertisements which has come out of our agency showed a girl in a bathtub, talking to her lover on the telephone. The headline: Darling, I'm having the most extraordinary experience...I'm head over heels in DOVE. (5) Five times as many people read the headline as read the body copy, so it is important that these glancers should at least be told what brand is being advertised. That is why you should always include the brand name in your headlines. (6) Include your selling promise in your headline. This requires long headlines. When the New York University School of Retailing ran headline tests with the cooperation of a big department store, they found that headlines of ten words or longer, containing news and information, consistently sold more merchandise than short headlines. (7) People are more likely to read your body copy if your headline arouses their curiosity; so you should end your headline with a lure to read on. (8) Some copywriters write tricky headlines - puns, literary allusions, and other obscurities. This is a sin. In the average newspaper your headline has to compete with attention with 350 others. Research has shown that readers travel so fast through this jungle that they don't stop to decipher the meaning of obscure headlines. Your headline must telegraph what you want to say, and it must telegraph it in plain language. Don't play games with the reader. In 1960 the Times Literary Supplement attacked the whimsical tradition in British advertising, calling it "self-indulgent - a kind of middle-class private joke, apparently designed to amuse the advertiser and his client". Amen. (9) Research shows that it is dangerous to use negatives in headlines. If, for example, you write OUR SALT CONTAINS NO ARSENIC. (10) Avoid blind headlines - the kind which mean nothing unless you read the body copy underneath them; most people don't. *When the chief engineer at the Rolls-Royce factory read this, he shook his head sadly and said, "It is time we did something about that damned clock." The history of advertising 6 - David Ogilvy's 'Confessions'.